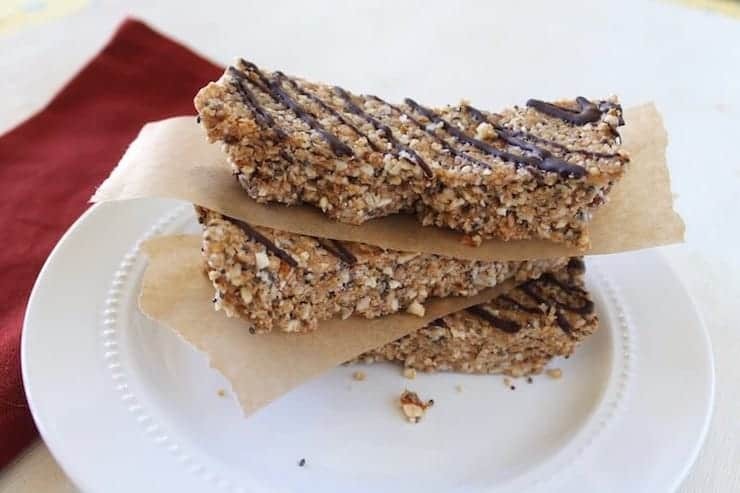 These healthy homemade paleo protein bars are packed with nuts, seeds and drizzled with chocolate. They make a delicious quick and easy vegan high protein breakfast that will help keep you fuller longer! 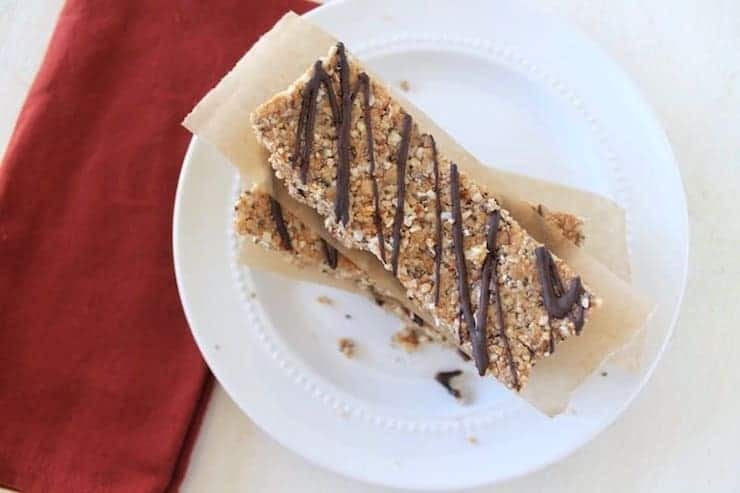 I created this paleo granola bar recipe without peanut butter (I used almond butter instead), but if you prefer peanut butter, you can substitute the almond butter for peanut butter. 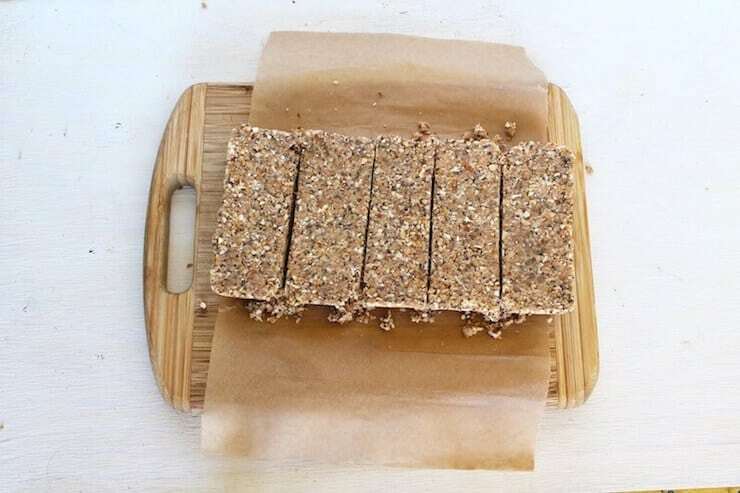 These are HEFTY protein bars for the everyday person. I intended these to be a sort of homemade meal replacement bar if you know you’re going to be traveling and you don’t want to be stuck with pastries or bagels. Or you can use these bars as a quick breakfast if you’re having a tough time getting something to eat before work in the mornings. They are pretty big for snacks for the rest of us, but you can easily cut them into smaller bits if you prefer to have them for snacks. 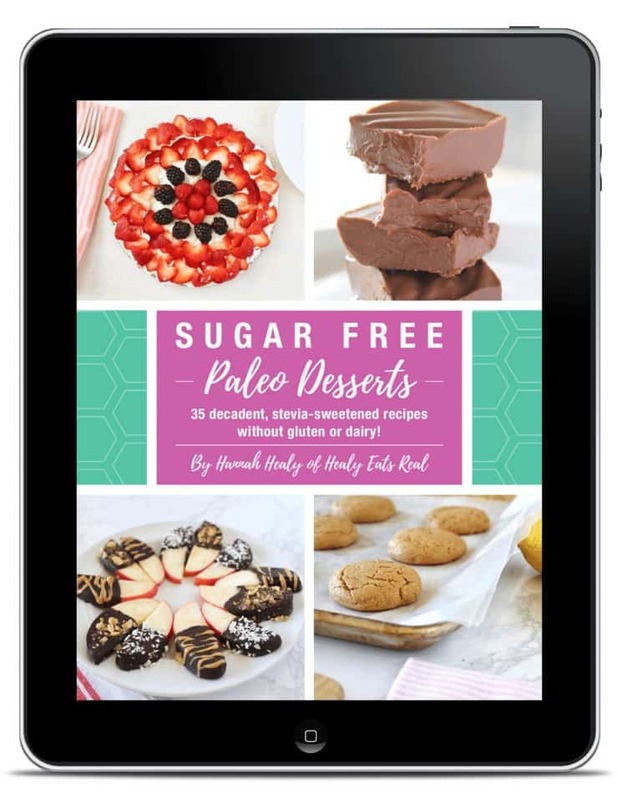 I used collagen gelatin protein powder for this recipe because it is my favorite type of clean protein powder to use (read here why gelatin is one of the BEST superfoods!). Not only is it super healthy and allergy friendly, but it also doesn’t really taste like anything. You can try other protein powders, but do so at your own risk! I can’t guarantee that it will come out the same or even taste any good for that matter. I think when it comes to vegan protein powders hemp or pea protein is the healthiest option in general, BUT if I’m being totally honest those are pretty gross tasting, so I think those would affect the tasty flavor of this bar. Rice protein is a good substitute for this recipe that wouldn’t ruin the flavor (even though I’m not a huge fan of rice protein nutritionally speaking), I think it’s ok every once in a while. Feel free to experiment with your own favorite flavorless (or vanilla flavored) vegan protein substitutes….just don’t get mad at me if you try a weird one and it tastes bad….you’ve been forewarned! 😉 You might have to add more honey or almond butter for stickyness depending on the protein powder that you use. 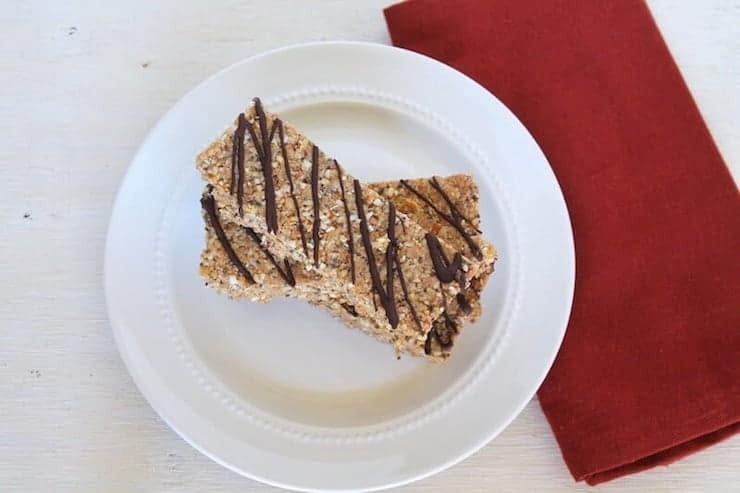 Did you like Homemade Paleo Protein Bars Recipe (Vegan & GF)? Don’t forget to rate the recipe and leave me a comment below. You can also follow me on Facebook, Instagram, Pinterest! Combine the almond meal, ground flax seeds, chia seeds, protein and shredded coconut in a mixing bowl. Mix with a spoon. Add the almond butter and honey to the bowl and mix with a spoon, then use your hands to fully combine all the ingredients. The result should be a crumbly texture (it shouldn't be all stuck together like dough). Line a 9x5 inch loaf pan with parchment paper. Press the mixture into the pan firmly. You'll really want to press in hard all over to pack in the mixture tightly--this will ensure that the bars hold their shape. Place the bars in the refrigerator overnight or for at least 3-5 hours. After it's been refrigerated take it out of the pan with the parchment paper and use a sharp knife to cut it into 5 bars. Melt the chocolate in a double boiler. While it's melted drizzle the chocolate evenly over the bars and place in the freezer for a few minutes to set the chocolate. Keep the bars in the refrigerator. You can also freeze them to keep them around for longer, they will last at least a month in the freezer in a freezer bag. Just be sure to defrost them before eating them out of the freezer. I am always looking for a quick grab-n-go option in the morning, excellent!! These would be perfect in the morning for me because I’am always running a little late and don’t have time to make breakfast. They sound pretty filling too! Beautiful little bars! Love the chocolate on top! I definitely need one of these today!! Protein bars are a lifesaver and no bake ones are the best! They look unreal, love your photos! 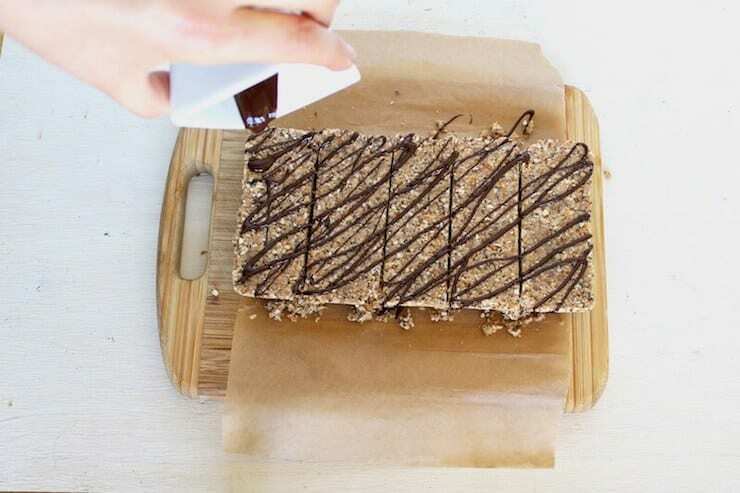 Could really go for a few of these protein bars about now! Wow! That is so easy! I need a new morning snack recipe for my school aged girls and this will be perfect! Thank you! These sound great and so easy to make! I love all of that collagen in there too! What a great way to get more gelatin into my diet. These look so good!! I always need more protein bar choices for after workout snack. This is perfect. Thanks for sharing this wonderful recipe ! These look great. Love the chocolate drizzle on top! I may make some of these for my backpacking trip to the Grand Canyon next month! Love the chocolate drizzle. 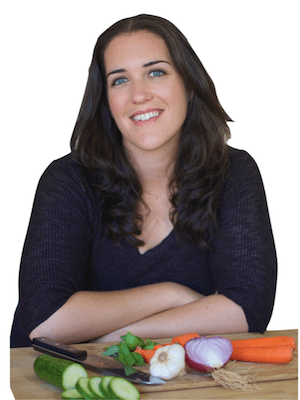 What a great recipe for a healthy snack on the go! 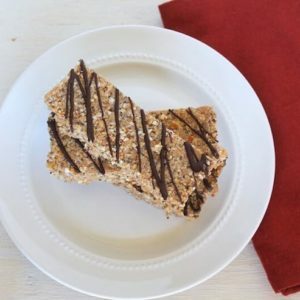 I love homemade bars like this for on the go healthy eating! I can’t wait to try these because they’re nice and high in protein! 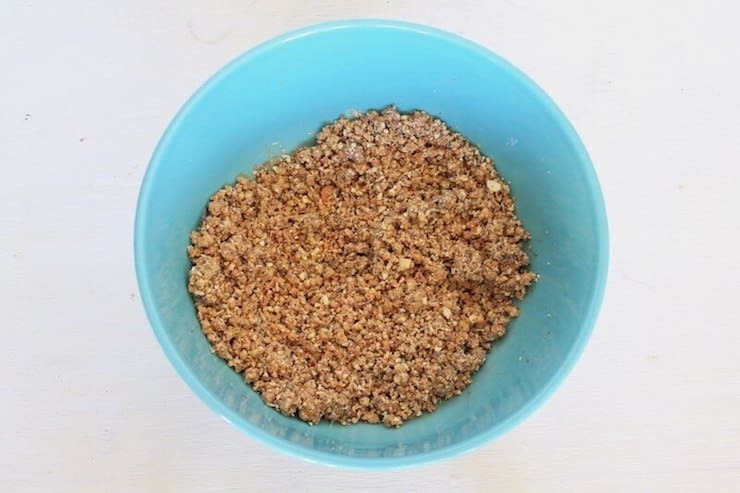 What can you use instead of Almond meal? I haven’t experimented with other flours, but another nut flour would probably work and possibly another gluten free flour. Coconut flour would not work. Would this recipe work with regular gelatin, not hydrolysate? I have grass-fed gelatin on hand but not hydrolysate… but I don’t want to waste 3/4 cup of it. 🙂 This looks like a great way to get more protein/collagen into easy snacks! Thanks! No it won’t work with regular gelatin, only hydrolysate.